End of Term Service Appreciation – Still Time to Order! In many churches, May and June are a busy time of year as far as service appreciation goes. The end of the school year coincides for many with the end of the volunteer service term. Some folks will be stepping down as they’ve completed their current service, while others will be marking milestone years of volunteering. 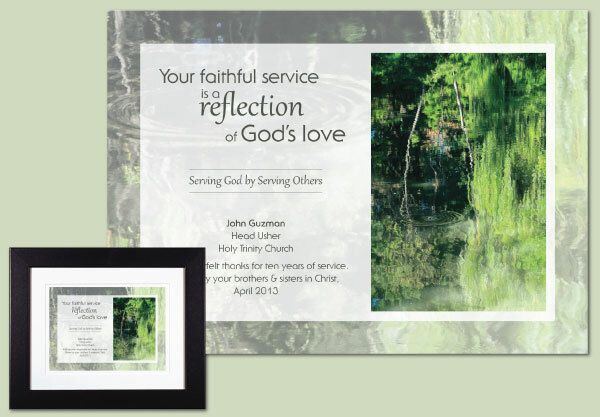 If your congregation would like to convey thanks to dedicated volunteers in a tangible way, we have dozens of appreciation plaques to choose from. Each one can be personalized, and they can be used for virtually any job function. Browse our service appreciation plaques here (suitable for any purpose), or take a look at the teacher appreciation collection, and the musician appreciation collection.